Summer Barbecues at Nathaniel Witherell: Good Friends and Great Food! Fresh air, bright summer blossoms, the delicious aroma of freshly grilled food—these make summer one of our favorite seasons. 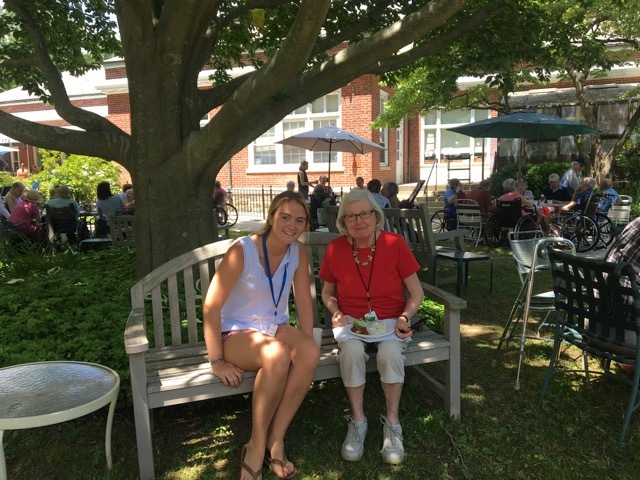 For Nathaniel Witherell residents, weekly lunchtime barbecues are a high point of summer. 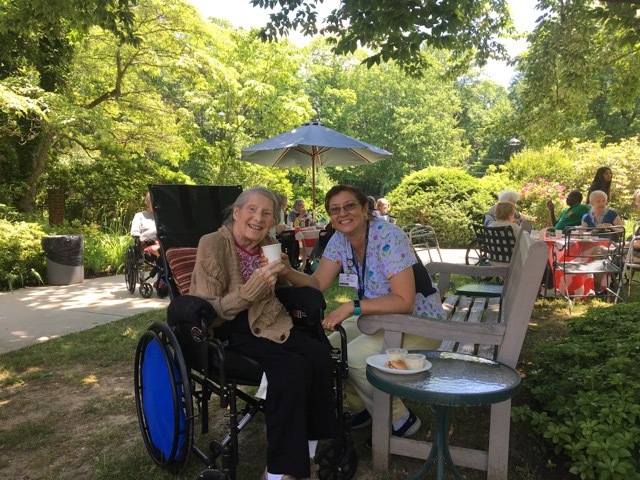 Each Wednesday, residents of both the short-term and long term care units can be found in our beautiful rose garden, enjoying nature, camaraderie, and gourmet fare. The barbecues run weekly through Labor Day. Residents attend bi-weekly, and attendance rotates by floor to include both long term and short-term care units. Family members, caregivers, and friends are also invited to join, and guests gather around festive picnic tables beneath large patio umbrellas. And local high school and college students get into the act, too. 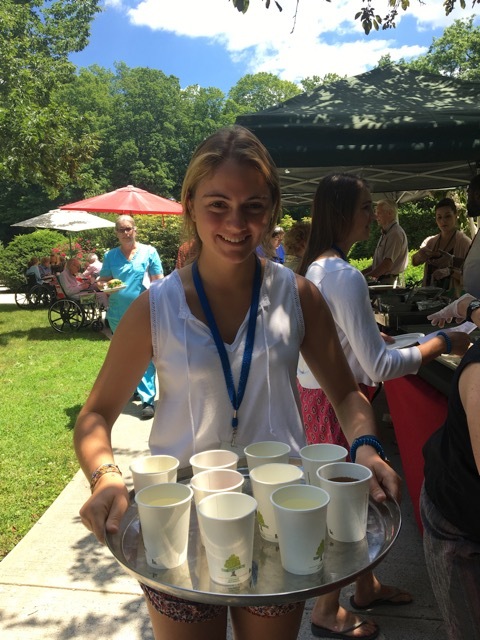 They are our attentive “wait staff”—volunteers on summer break— who stand by, ready to assist with wheelchairs and serving drinks. The Nathaniel Witherell’s top notch catering staff prepares the weekly feast, featuring hamburgers, hot dogs, and ribs, as well as summer specials, such as grilled salmon. Brown says that Nathaniell Witherell’s dietician supervises menu options to ensure residents’ dietary needs are adhered to. 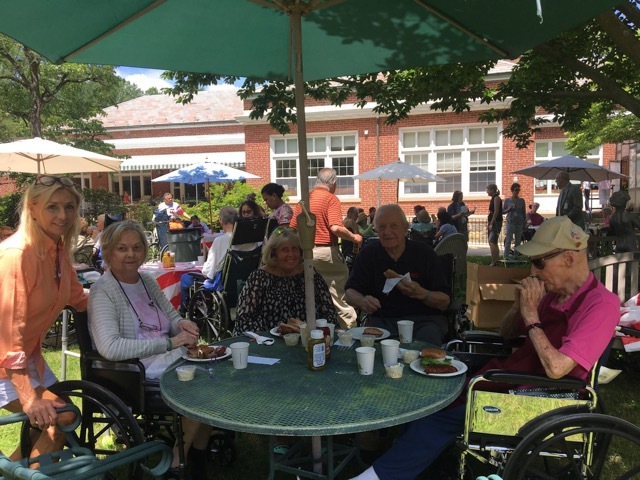 Aides provide feeding assistance, as needed, and options like chopped and pureed food are made available so that everyone can attend and enjoy.